Howdy! 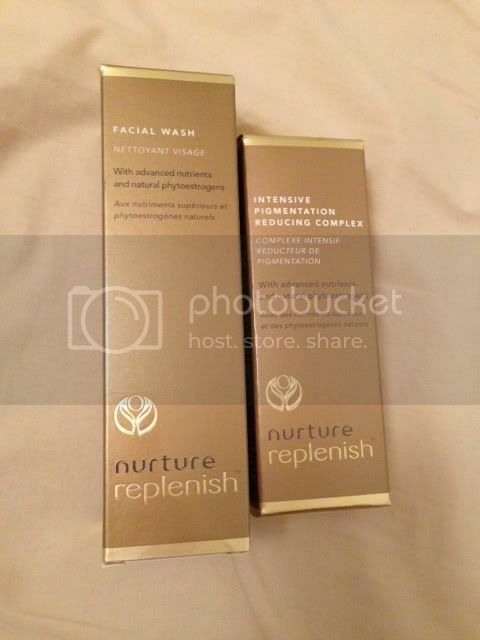 So today I'm taking a look at the Nurture Skin Care Range. When I was approached by them, I must confess it was not a brand I'd heard of, but to be completely honest,as someone who does not follow a skin care regime, I've not really heard of any! Yes, that's right, I'm one of those terrible people who sleeps in make up, if I do take it off it's either with a make-up wipe or one of Poppy's baby wipes! I don't moisturise very often and I definitely don't exfoliate or any of that jazz! I've always been the same, I try but I just forget! So I thought it would be a challenge to myself to try and get myself into a routine. The products I was sent are the Replenish Facial Wash and the Replenish Intensive Pigmentation Reducing Complex. The face wash is really nice to use, it has a pleasant fragrance that isn't too overpowering, it froths up but not too much and left my skin feeling refreshed without any dryness. I've only been using it every other day, as, well I forgot as per usual, but it seems to be agreeing with my skin, I haven't had any reactions to it, and although I've had the odd spot, they've been my usual monthly hormonal ones, nothing abnormal. The pigmentation cream isn't the most pleasant smelling of products if I'm honest, but it goes on well and and soaks into my skin nicely. I haven't been using it long enough or frequent enough to notice any change, but I'll stick with it and see if it helps with some of the problem areas a have. The products have a luxurious feel and look to them, all in all I was impressed with the products, especially the face wash and at a mid price range I think they are good value for money. Thank you so much for the tips. I am now actually relieved to know that I have been already following these tips for my skin prior to reading this article. Thank you and keep writing such profitable blog posts.